Another one of my crazy thoughts, I want to start waxing myself at home. SHOOT ME NOW! I have plans to wax my underarms and the full monty heading south! Any other takers? LOL! Love the videos, but kind of shame about her messy room! 1.Put the ingredients in a saucepan and heat it on high. It will boil for approximately ten minutes. 2. Watch the bubbles carefully and when the bubbles turn a light brown color, turn the heat down till it's as low as it can be. The wax should be turning a golden brown color. 3. Let it simmer for about another five minutes while watching very very carefully. 4. Even use a candy thermometer, when temp. 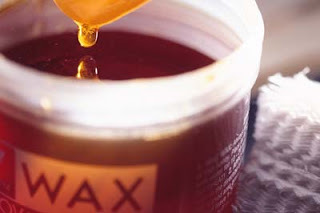 reaches between 250 - 260 degrees, the wax is done or when the wax is on step three and is simmering take a tiny bit out on a spoon and run cold water over it. When it cools enough to touch, it should be stretchy. You can test it on your arm. Do this about every two minutes while the wax is simmering until it stretches out on your arm and pulls off easily. If it sticks and won't come off it's not done and if it's brittle you've overcooked it.